Having had asthma basically all my life one thing I have come to realise is the importance of your relationship with your GP or asthma nurse. For many they are the front line for you and your asthma care. I am so fortunate to have a GP who is really understanding and although she finds my asthma baffling she will listen to me and help me when and where she can. Little things like making sure my medications are prescribed correctly, I get my flu jab etc. They also have various flags on their file on the system- this helps so much. Many dread the phone call into the GP to try and get an appointment because their chest is not good but you have to get passed the gate keepers- the reception staff!!! Before the flags were on the system I used to have great difficulty trying to explain the importance of being seen promptly because my asthma goes off so quickly. It was a nightmare- I understand why they need to do it as appointments are short for the number of patients that need to be seen but when it is asthma it can be different. After a bad experience not being able to get an appointment on the day because the reception staff thought it could wait, I ended up in hospital! During my follow up appointment with my GP which because I had been in hospital I was able to arrange via the reception staff, my GP was slightly irritated at me not being seen as it is important and could prevent hospital admissions. Since that follow up appointment there is a flag which says if I am phoning in about my asthma I am to be seen by either my GP or one of the nurse practitioners who know my chest very well. There is also a flag that if I say I need antibiotics I can have a phone call rather than appointment and a final flag that if I feel I need to go to hospital they are to call the respiratory reg on call and arrange this. Having these flags has made such a difference and offered a sense of security as I know if my asthma is bad then I will be dealt with urgently. Obviously if I call about something else I would need to wait just like everyone else. I realise I am very fortunate to have all this set up. I wanted to highlight it so that others can ask their GP surgeries about this to help them manage their asthma better as it is a huge stressor when you asthma is bad and not able to get the help. Something so simple as a flag can make the world of difference. There is so much research into asthma just now looking at a cure for asthma, better management, getting asthmatics to comply with treatment better but research into asthma death, often a taboo subject to talk about is vital to make any change in the shocking asthma statistics. Ann an children’s asthma nurse specialist is also one of the PhD students at the Asthma UK Centre for Applied Research. Her PhD is looking to speak to parents of children who have died from asthma. The importance of this I think is two fold. Initially the whole concept of this PhD came from one of the Patient and Public Involvement Leads at AUKCAR whose own daughter died from asthma. Having a PPI member come up with the research idea and the centre then backing it really highlights just how much AUKCAR values the patient and public group by implementing project ideas that come from them. Secondly this PhD is so vital. Only a few months back it was revealed that across Europe, the UK has the worst rate of asthma deaths and a rate that we all hoped would improve after the National Review of Asthma Death (NRAD) was published in 2014. However this is not the case. In the UK death is very much a taboo subject. People don’t like using the term death or died. You see the term passed away or lost- you don’t lose someone if they die because if you go looking you won’t find them again. Asthma death is just that and I know people who have had family members die from asthma also do not like the term lost. For the first time research is being undertaken by an asthma nurse specialist who deals with a number of people with severe and life threatening asthma. Rather than speaking to medical staff, Dr’s and nurses Ann is going to be speaking with those directly affected by asthma death. Ann wants to speak to parents or carers whose child has died as a result of asthma. Speaking to you will mean we can learn from your experience and make a change for the future. Have you been affected by asthma death in the last 10 years (in or after 2008)? Has your child died between he age of 5-24 and you were there with them. Would you like to speak to Ann and help make a change for the future? All you need to do is email Ann: ann.mcmurray@ed.ac.uk or by phone/ text on 07976582297. You will have a single face to face chat with Ann in a place that you are comfortable which will last no longer than 2 hours. The study has been reviewed by the West of Scotland Research Ethics Committee 3 (WoSREC3) and Patient Public Involvement volunteers of the Asthma UK Centre for Applied Research (AUKCAR). 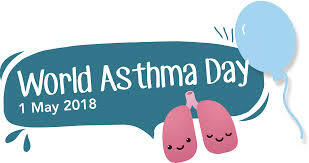 On Tuesday 1st May is was World Asthma Day. I normally do something during the day, or post a video etc raising awareness about asthma, how serious it is, how critically under funded research into asthma is. This year however I didnt do anything I just wasn’t well enough, my chest was far from good and lacked any ability to concentrate and focus on anything, mainly due to the high doses of prednisilone which leave you with a mind that has been put in a blender and constantly mixing your thoughts up and also due to the lack of sleep again thanks to the prednisilone but also my breathing has been getting worse in the late afternoon, evening and into the night making sleep difficult. But World Asthma Day 2018 was recognised by Asthma UK with a huge thunderclap on how to deal with asthma attacks which reached far and wide across social media. However there was some very disappointing news also announced which is devastating and really makes you think how, why and when will those in power do something about it. 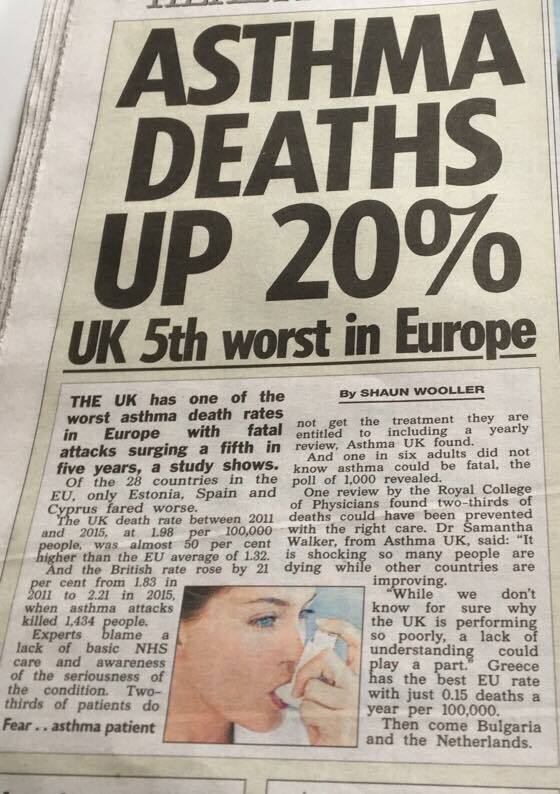 What Im talking about is the UK’s statistic on asthma deaths. World Asthma Day 2014 saw the publications of the National Review of Asthma Deaths (NRAD) which showed the devastating numbers of people dying from asthma but also that over 2/3 of those deaths would have been preventable had they received the correct asthma care including having an asthma action plan in place, having regular asthma reviews and also correct inhaler technique. The publication of NRAD was meant to be a turning point in asthma care given the shocking statistics. I remember at the time thinking it was bad and that so many people shouldn’t be dying from asthma so you can imagine my shock, upset, dismay when I woke up to hear that asthma statistics have not got any better in the last 4 years in-fact they have got worse. Asthma deaths are 20% worse than they were 4 years ago making asthma statistics in the UK as the 5th worst across Europe and only one of three countries whose death rate increased rather than decreased. It is really shocking but then I sit and think a bit more about it and am I really surprised? I don’t think I am. I didnt think the rate would have increased as much as it has but if Im honest as a patient I really don’t see any changes that have had a big impact on asthma management, and if there are no changes there then there won’t be much of a change in the statistics. As a patient who has asthma and does use a variety of NHS services because of my asthma I have not noticed any changes in how asthma is managed and monitored. I know my asthma is not run of the mill asthma and is more complex therefore GP’s and asthma nurses in primary care do not have a lot of input into my care other than my annual asthma review which the asthma nurse does at the GP survey. However the review tends to be me updating them on the new research that is out and what new treatments are available. I am often told that I know my asthma better than anyone so they are going to let me self manage but will be there if I need them. I understand why they do this however as a life long asthmatic and a very difficult to control asthmatic I cannot remember the last time I had my inhaler technique reviewed. I don’t think I am doing it wrong as take my inhaler the same way I always have. I also don’t have a written asthma action plan. I have bugged my (now old) consultant for one because being on maximum doses of inhalers I don’t have room to move should I get a cold or chest infection. Now that I am going to have a different consultant who i hope to have a better relationship with and will work with me rather than against me or just not work with me at all leaving me to do most of my management and hoping for the best (mostly I think i do the right thing!). But this got me thinking, how many other asthmatics like me who are difficult to control are just left to do their own thing because the asthma nurses they see say the same as mine that they are far more knowledgable than they are. One of the other problems I see often and I think is a potential barrier to reducing the number of deaths due to asthma is those who have asthma give it the respect it deserves and be sensible with it. Due to the difficulty I have with my asthma and the isolation I feel as a result of it I am in several support groups for asthma, brittle asthma and difficult to control asthma. It is here where you can chat to people who know exactly how you feel, how debilitating it is and the frustration you feel when you try to do everything right but still your asthma is not behaving. These groups are a great source of support however there is one very concerning theme which keeps recurring which no doubt is also a factor for so many asthma deaths and this is not getting help early. I will often see posts made by people saying they have been using whole inhalers in a couple of days, or they are struggling to talk and having an asthma attack and they don’t know what to do. In these groups we do not give any medical advice but would suggest the person concerned follows their asthma action plan to which some would reply saying they don’t have on, or that they go and get seen by a GP or hospital. Again some group members would respond saying the GP does nothing except give them steroids or send them to the hospital. There is also the situation at night when GP practices are closed so you need to phone NHS24 and they will assess if you need to be seen by a Dr. Many people again don’t see the point in going to out of hours because they don’t know you so wouldn’t be able to do much. It really frustrates me when this happens. I can understand that asthma is very tricky to deal with as there are so many different phenotypes so seeing your own GP is preferable but it won’t always happen that way and more than likely it is during the night when you start struggling to breathe. Now for the last, most serious, and riskiest behaviour that also occurs in these groups which could quite easily cause death. What am I talking about is when people post photos of their oxygen saturations or heart rate accompanied by a comment about how much they are struggling and finding it difficult to talk and don’t know what to do. Again naturally you would offer support and see what they have already taken, followed their action plan and if all this has been done the next step is to go to A&E to be reviewed, have their chest sounded and some treatment if needed to get their chest and asthma back under control. The problem occurs when you have given them some advice and recommendations like they asked for however they don’t take it. Many say that going to A&E is a waste of time because they get told their oxygen saturations are ok and their chest is wheezy but they will be ok. They may be given some nebulisers and prednisilone and allowed home. They see this as a waste of time as some feel they can do everything they are being given in A&E. They don’t see the value of attending as they see it as just getting some medication but actually the Dr or nurses are assessing them to see how much effort they are putting into there breathing and if they are using their accessory muscles to help, they will also have bloods taken which can show if they have any infection and require antibiotics. So it might not seem that much is being done but there is a whole assessment taking place. Then there are another group of severe asthmatics who won’t go to A&E early as they feel they are always up at the hospital being admitted for their asthma or being seen in outpatient clinic so they want to maximise their time at home so will stay there until they are really struggling which is when it gets dangerous as an urgent ambulance is often required and the resus room is on standby for you so you get treated straight away and stabilised before moving to a ward. I don’t think people realise that by staying home longer they are taking a big gamble that they will okish by the time the ambulance arrives and takes them to the hospital. The longer they leave it the longer and harder it is to get back to baseline and the more medication to help relax the constricted airways. This also means that they will require additional medications to treat the asthma and any infection present plus more medications for the side effects of prednisilone. By delaying when you decide to go and get help because your asthma has got more difficult is critical because you don’t know how severe the attack may be and if your out with a bad chest you may be exposed to triggers and because your not well your airways are going to be more sensitive. I guess the message I am trying to get across is that no matter how busy you are in life or how much you feel you spend off work and in the hospital nothing makes up for not having a life which is what will happen if you don’t go and get help early for your asthma.